COMPACT is one of the most flexible ranges on the market. With its clean, fresh rolling curves, the design will lend it self to both modern and traditional designed bathrooms. 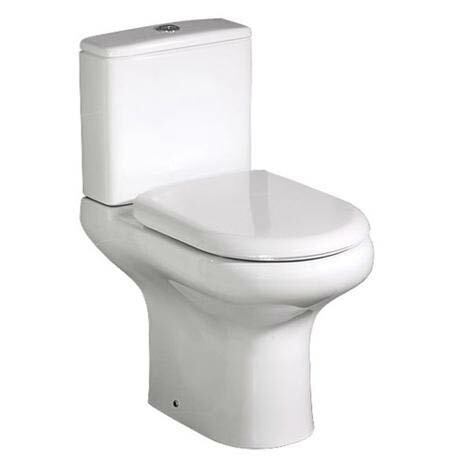 The Compact close coupled WC comes with a dual flush cistern and a soft closing wrap over seat. Hi John, the 20 Year guarantee offered with this product is offered by the products Manufacturer. The guarantee offered is against any manufacturing defects on this product when used in normal domestic or (when stated commercial use) application. Serviceable parts are not part of a products warranty, in addition neglect or abuse of products will make null and void any warranty period. Bathroom products that are complimented by a finished surface eg. Chrome or gold, the guarantee period will apply to the surface finish, but does not apply to any damage to surface caused by abuse. In the event of a fault developing please contact us, we will then advise what the manufacturer's procedures are. Manufacturers will ask for the following to have been adhered to; product was fitted as per the manufacturers fitting instructions, proof of purchase supplied, no Modifications or misuse, neglect or mistreatment. I hope this helps, please let me know if you have any further questions. Q. Does this have a vertical or horizontal waste pipe? The pan's waste exits horizontally on this model. You can see this under the dimensions tab. Q. Which side is the water inlet & is cistern 6/4ltr? Not installed yet but looks good and will fit into my new bathroom layout perfectly. Ordered and delivery handled very efficiently bt Victorian Plumbing. After being quoted a higher rate from a local supplier giving us their best deal Victoria Plumbing was cheaper and could deliver sooner. What more can you ask for? Very happy with the toilet. Very pleased with this item, easy to install, quick delivery at a good price. This toilet is great with its clean, and smooth curves, the design fits in well with my modern designed bathroom. A well deserved 5 stars from me!